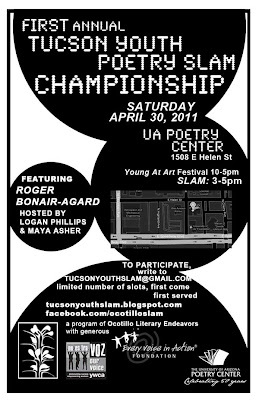 First Annual TUCSON YOUTH POETRY SLAM (TYPS) CHAMPIONSHIP! Over 20 of Tucson’s best poets 18 & under throw down in a championship poetry slam! Judges picked from the audience! Cash prizes totaling $200! Featured poet: from Trinidad by way of Brooklyn the renown poet and performer ROGER BONAIR-AGARD! One of the most well-respected voices of the spoken word movement! Listen to a NPR interview with Mr. Bonair-Agard here. Hosted by poets MAYA ASHER and LOGAN PHILLIPS! All poets who are interested in competing must have participated in AT LEAST ONE regular TYPS event since October 2010. Poets must reserve their spot by emailing tucsonyouthslam (at) gmail.com before Thurs. 4/28. Limited number of slots! First come, first served! Participating poets will be invited to take a workshop with Roger Bonair Agard the day before the championship! An AMAZING opportunity! Part of the UA Poetry Center’s YOUNG AT ART festival, more info on the festival’s other great events here. Made possible with the generous support of the Every Voice in Action Foundation, the YWCA Racial Justice Program and Bentley’s House of Coffee and Tea. Tucson Youth Poetry Slam Championship 2011 – ¡RESULTS & VIDEO!